We are home and (sort of) unpacked after a great 9 days in the Cotswolds and Bristol. So as I sit down to watch the closing cereymony of the London 2012 Olympics here is a wee recap of our week that was. Friday – arrived into Bristol airport, and relived some happy memories as we crossed over the Clifton Suspension Bridge. By the time we had stopped for dinner, and found our way to our house swap cottage, it was getting dark. The house was an amazing old bake house, must find out how old, with thick stone walls, quirky shaped doors and 2 spiral staircases. Here is how it looked in daylight! 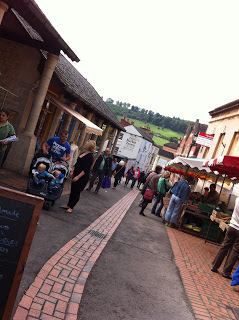 I blogged in greater detail here about Stroud Food Market, an amazing place. Stroud is a great town – it is not cute and touristy, but has a lovely welcoming feel to it, and some great independently owned shops. Saturday afternoon we all enjoyed relaxing in the amazing gardens which included tree house, swings, slide, stream, den, camp fire, a hot tub (not working unfortunately), and even it’s own wood. I was keen to explore some of the lovely local villages and we headed to Minchinhampton, the local village to Gatscombe Park where Princess Anne lives – it was ever so slightly patriotic! Our first day back into Bristol, and we revisited some old haunts, including Westbury-on-Trym where our eldest spent a lovely year in P1, and then back to our old rented house in The Crescent. We were invited to lunch with friends and had a lovely afternoon with them, which included a walk on The Downs, and incredible unique open space in the middle of the city, with distant views of Clifton Suspension Bridge. The other day I blogged when we were away, so you can see more about Arlington Row and Sherbourne here, but here is another image of that beautiful village. This was declared Shopping Day or Zoo Day depending on your preference. We were reunited later in the afternoon, to spend a few hours with the Tate family – lovely to spend time with them, and our kids very reluctant to say goodbye. Wednesday was Westonbirt – a fantastic forest park which is the National Arboretum (no, I didn’t know what an arboretum was either!). Between Westonbirt and the town of Tetbury we passed Highgrove, where Prince Charles has his residence. We had one of our best meals in a long time at the Priory Inn in Tetbury – a 30 mile food zone resturant. 90% of all ingredients sourced locally. We had incredible pizzas and managed to make room for some desserts too. Another Bristol day – @Bristol (an interactive kids science museum) for the father/son, and my daughters and I explored the harbour area and the shops of course. At one point we sat on striped deckchairs to watch the Olympics on a large screen – very British! Another Bristol family, and another meal, this time at Cosmos Restaurant at Clifton Triangle with the Troughtons. Part of the reason we planned this holiday was that it would coincide with the Bristol Balloon Fiesta – which was one of the highlights of our year back in 2004. I will do another entire balloon post but needless to say it was a beautiful day. Last full day, and another visit to Stroud, then packing and cleaning. The kids didn’t want to leave – always the sign of a great house swap. We headed into Bristol and our favourite area, Clifton, for one last time. We had a delicious brunch in The Primrose Cafe, and headed over to the bridge for a last time. Love that view. So back to the airport, hire car returned without damage, and few back into a damp misty Belfast. Home! Watching the closing ceremony – are you watching? More blogging soon, leave a comment (hint) if you wish. So glad you enjoyed yourself and shared all the loveliest of bits once again. So nice to go, nice to be home I bet, too. I used to love shopping in Bristol, although i haven’t been back in years. Westonbirt is gorgeous though, i do remember it from my childhood. Olympics closing ceremony was fantastic! But I personally think they should have stopped after Take That came on. They were brilliant and the song choice was the best. It’s wet up here on the north coast too, let’s hope it dries up today! Glad you had a great time! I’m about 8 miles from Stroud! I didn’t enjoy the closing ceremony as much as the opening – thought Brand a very inappropriate choice but loved Eric Idle and the Who!!! Also we never quite got used to bumping our heads on the low beams! Loved Take That but definitely preferred the Opening Ceremony. Maybe manage to meet up this week? The Opening Ceremony definitely the better of the two. Lucky you living near Stroud – i loved it! My profile is acting up! !